I can still hardly believe it, but Michael Johnson’s 17-year-old mark of 43.18 from the 1999 World Championships in Seville has well and truly been topped by the extraordinary Wayde van Niekerk of South Africa. Seeing 43.03 come up on the TV screen is right up there with the best sporting moments I’ve ever witnessed. In my previous blog leading up to Rio I talked about Wayde being one of the outstanding athletes in the world at the moment and the possibility of him setting a new Olympic record, but he still surprised me by perfectly executing an incredibly bold race plan of going out hard for as long as he could and then holding on for dear life towards the end. How did he do it? Let’s look at his splits. Mind you, they’re not official, but I estimated them the best I could by studying a 50 fps video of the race. I used Premiere Pro and a timer with a very small margin of error (+/- a few 100ths of a second), so these splits should have enough credibility for us to talk about them. Photo for each split: 100m, 200m, 300m, 400m. He went out incredibly hard and I can safely say that the key to this world record was his first 200-300 meters. 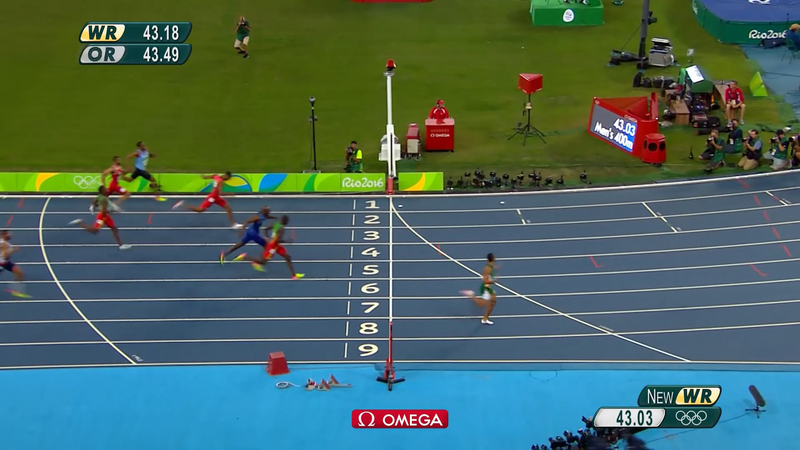 20.5 for the first 200m is one the fastest splits in history. 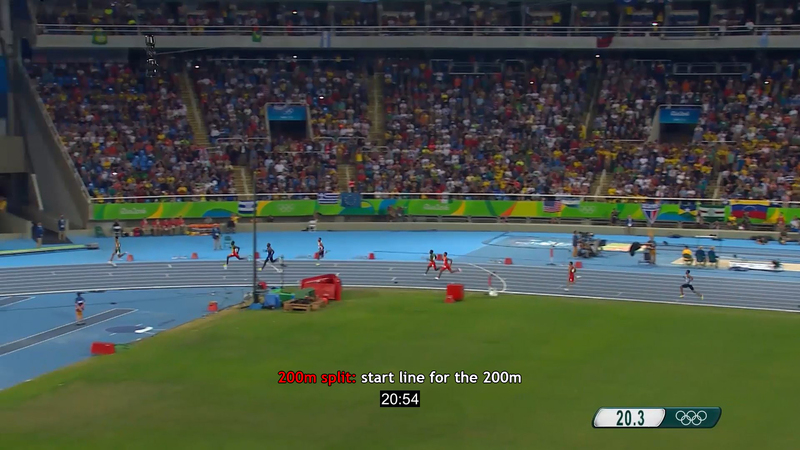 In fact, only Merritt’s 20.44 from this very race is quicker, and I clocked Kirani James at 20.56. This is just a testament to how fast these guys took it out over the first half of the race. 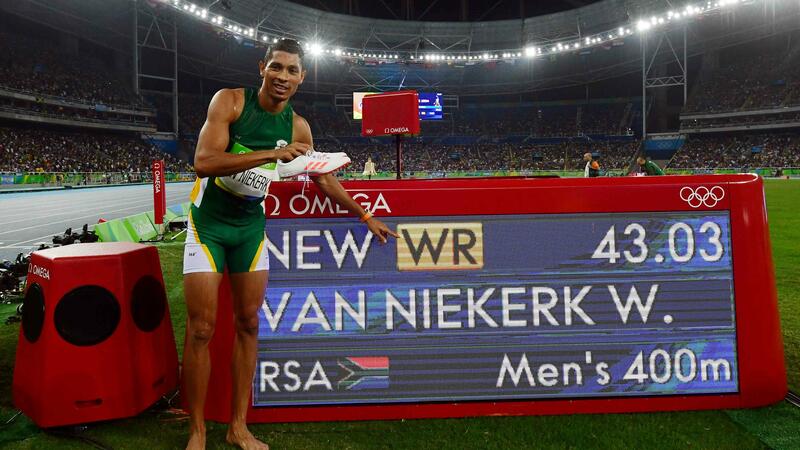 Van Niekerk then started to pull away at about 250m and he crossed the 300m mark in 31.04 – by far the fastest in history. It should be noted that Merritt and James were also under Johnson’s world record pace at 300m (I timed them at 31.2), but they decelerated dramatically more than van Niekerk who brilliantly maintained his form and stride length. 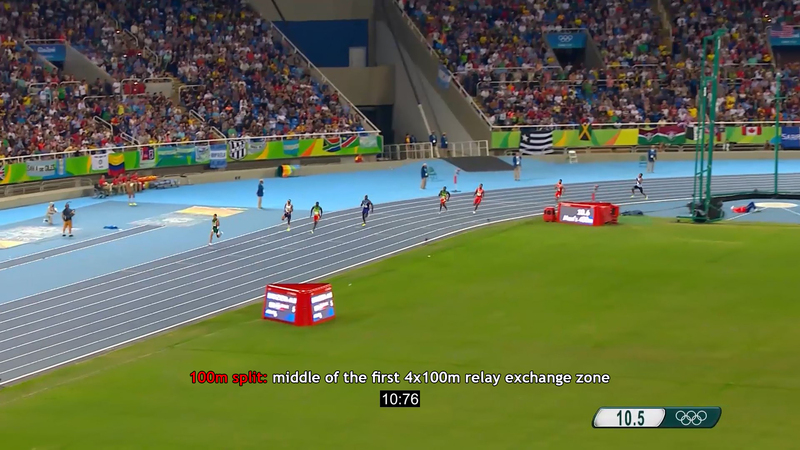 There’s one more thing that everyone’s talking about: Wayde did it from lane 8. So, what’s the deal? Well, running in the outer lanes is generally considered to be a disadvantage in the staggered sprints because you don’t get to see other athletes and you can’t pace your race based on how they’re running. So it’s mostly a psychological thing. The best placed athletes from the previous rounds are always put in the middle four lanes, but Wayde was 2nd in his semi final (behind Machel Cedenio) and as a result he wasn’t given one of the standard center lanes. And I think Wayde actually got lucky with his draw. I already talked about the advantage of sprinting in the outer lanes because of a more forgiving curve radius, but the thing that I believe played a big part in his amazing run was that van Niekerk didn’t have the distraction of seeing other athletes in front of him, so he was able to focus on his own race and he executed it to absolute perfection. This was also the outright fastest 400 meters run ever. Athletes usually run faster in the relays because of the added benefit of a “flying” start and without the need to react to the gun. Michael Johnson has the fastest recorded 4x400m relay split with 42.94 seconds from 1993. If we take Wayde’s 43.03 and subtract his reaction time of 0.181, we get 42.85! 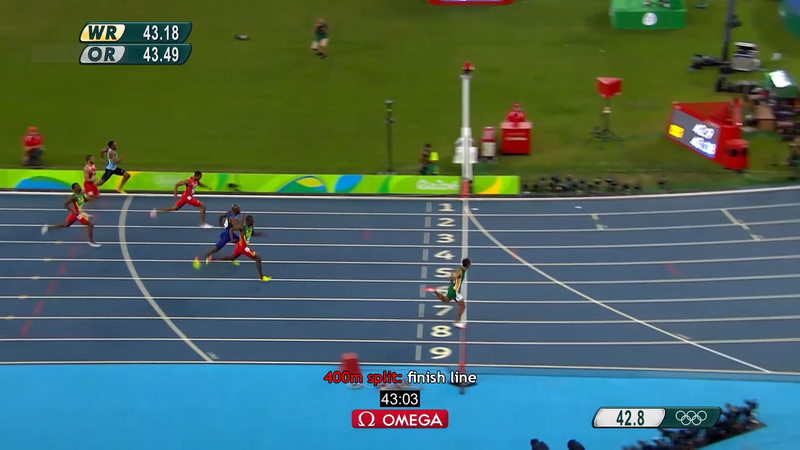 This was the highest quality 400m race in history. We’ve only for the second time ever seen three athletes dip under 44 seconds in the same race. Additionally, all the times for places from 4th to 8th were the fastest ever for those particular placings. 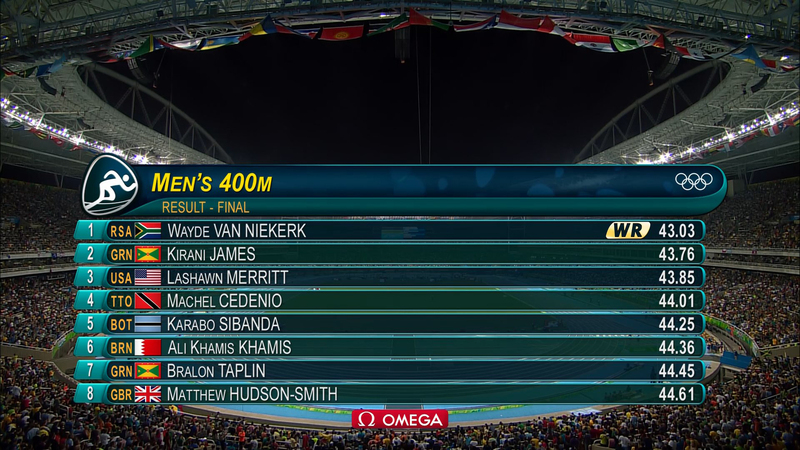 Coincidentally, van Niekerk has beaten the previous two Olympic champions. James won in 2012 (London) and Merritt in 2008 (Beijing). Previous Previous post: Bolt’s 9.69 in Beijing 2008. What Could He Have Run? I should know this……what is your technique for measure stride length? I think I know how to measure stride frequency. Please advise…. and thank you. You have to know the distance and then you count the strides that the athlete makes to cover the distance. Example: 100m distance and we count 45 strides; 100m/45 strides = 2.22 meters per stride. 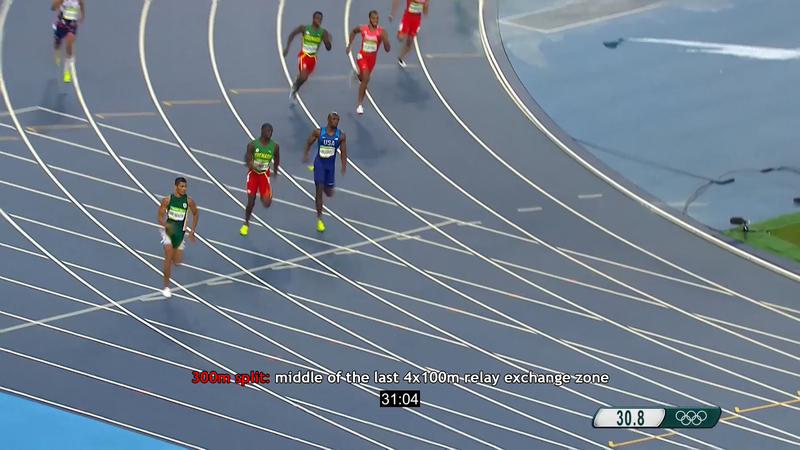 How do you know where the 300m and 100m mark are on the track, I can see the 200m is obvious because of the 200m race?